Our expertise starts with narrowing your decisions on choice of sign materials, sign size and sign quantity to reflect your image and in keeping with your campaign budget. 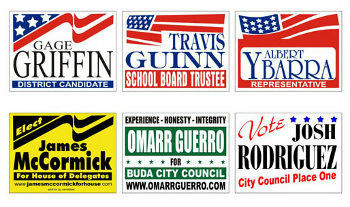 At Dollar Signs and Graphics we have been designing and printing political signs for many years. Our graphics designer can walk you through the design process - with your particular needs in mind.